Since meeting Robin last year, I’ve really gotten into wine. And by “really gotten into wine” I mean I actually pick something other than a Riesling when given the option! Robin’s super knowledgeable and has taught me a lot about different types, the way they’re made, how different regions affect taste, etc. So when I was recently given the opportunity to try four different kinds of CK Mondavi wines, I jumped on it! And I invited Robin over for a personal tasting. 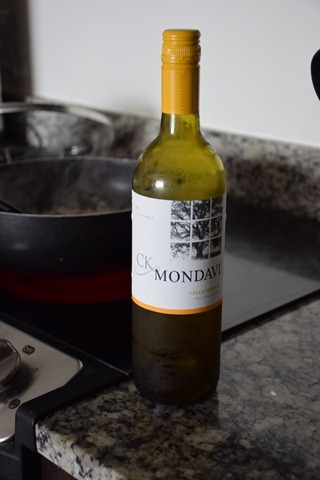 Before I share more about the types of wine we tried, I have to mention a few special facts about CK Mondavi. CK Mondavi is the only American made/grown win in the “supermarket wine under $10” category, AND it’s sold nationwide in every US state. If you’re “really into wine” like me, this is the perfect time to try CK Mondavi wines because a percentage of each bottle sold between May-August is donated to Intrepid Fallen Heroes (up to $50,000), an organization that supports the men and women of the Armed Forces and their families. 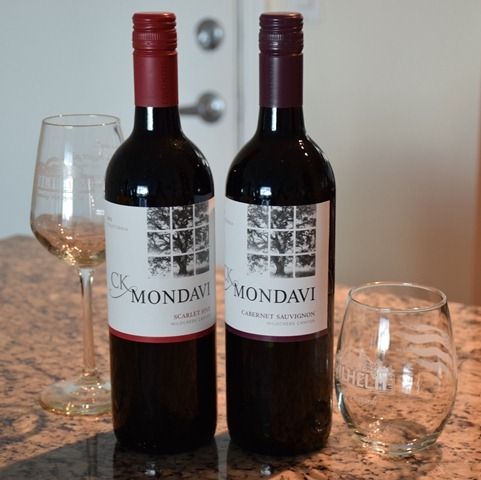 Robin and I had the pleasure of trying the following CK Mondavi wines: Blonde Five, Chardonnay, Scarlet Five, and Cabernet Sauvignon. Blonde Five – very fruity with a sweet aftertaste. This was Robin’s favorite out of the four we tried. We thought it would pair well with white meat, fish, and summer vegetables. Chardonnay – a little oaky with a mix of fruity and citrus flavors. We both liked this one and thought it was fairly refreshing. This wine would pair well with a heartier meal – pasta and a creamy cheese sauce perhaps. Scarlet Five – a full-bodied and well-balanced wine with hints of cherry and plum. Surprisingly, this one was my favorite. I loved the bold flavor and aftertaste. This wine is special as it based on five red varieties – Cabernet, Merlot, Petit Verdot, Cabernet Franc, and Malbec. Personally, I think this would go with any food pairing! Cabernet Sauvignon – slightly more full-bodied, oaky, with hints of lemon. Again, this wine was also refreshing but a little bolder than the Blonde Five. This would pair well with some chicken/seafood and creamy pasta. Overall, we were fans of all the wines and agreed that we could see ourselves buying a bottle…or two…in the future. Not only did I try the wine, but I cooked with it as well! I made what is quickly becoming mine and Vishnu’s favorite homemade meal – risotto. It’s rich, creamy, and delicious. And when you use a good wine, it increases the flavor so much! A quick tip for cooking with wine – pick something you like to drink. I’m not a pro by any means, but that always works for me. This particular risotto was made with the Chardonnay, shitake mushrooms, and basil walnut pesto. I honestly could’ve eaten the entire batch myself! It would pair perfectly with a side salad and a glass of wine for the perfect summer meal. You could also serve it with baked chicken/fish for some extra protein. One more tip – remember to be patient when making risotto. This is a dish that can’t be rushed. When the recipe says to allow all the liquid to absorb before adding more, make sure the liquid is absorbed! Just trust me on that! Heat a large skillet over medium heat. Add olive oil and butter and allow to melt. Add shallots and mushrooms and cook until shallots are translucent (about 5 minutes). In a separate saucepan, heat broth over medium heat. Add rice to shallot and mushroom mixture and cook for an additional 2-3 minutes. Add wine and allow to cook for another 3-5 minutes until wine is absorbed. Keep your eye on the rice and stir frequently. Season with salt and pepper. Add 1/3 cup broth to rice mixture and stir until broth is absorbed (don’t stop stirring!). Repeat until all the broth has been incorporated and absorbed. Turn the heat down to low. Fold pesto and parmesan cheese into the rice mixture. Adjust seasonings as needed. Enjoy! *Note: this pesto will be a little thicker than usual because it is being added to the risotto. Add basil leaves, walnuts, and parmesan cheese to food processor and pulse until finely chopped. Add lemon juice and olive oil and process until the mixture is creamy in appearance. Season with salt and pepper as needed. If this doesn’t make your mouth water, I’m not sure what will! I hope you enjoy lots of wine and delicious homemade meals (made with wine!) this summer. Alex and I actually got to visit the Mondavi winery when we were in Napa! It was gorgeous and the wine was so good! Now I want to try that walnut pesto 🙂 I never have pine nuts on hand, so a pesto recipe with walnuts would be perfect! That’s so fun! And the wine is really good considering the price point! risotto and wine together = my idea of dinner. I could honestly it this meal every single night! Oh wow- totally drooling at that risotto! I especially love the twist on pesto i.e. using walnuts instead of pine nuts. I have recently developed an appreciation for wine so I am almost certain that my summer will involve plenty of glasses ;)! Pine nuts are too expensive! Sometimes when I don’t have walnuts, I use almonds. Works like a charm! 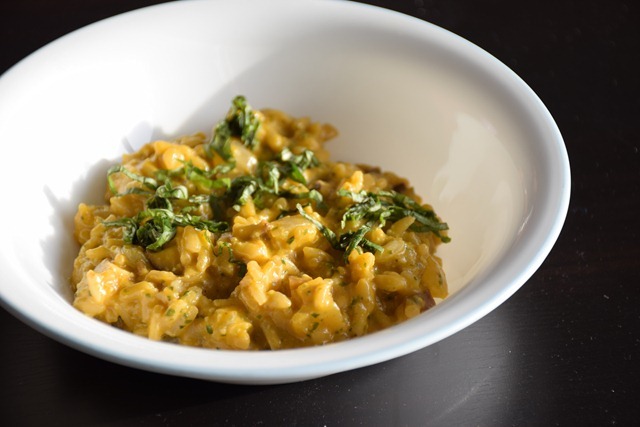 Parita – that risotto sounds amazing! 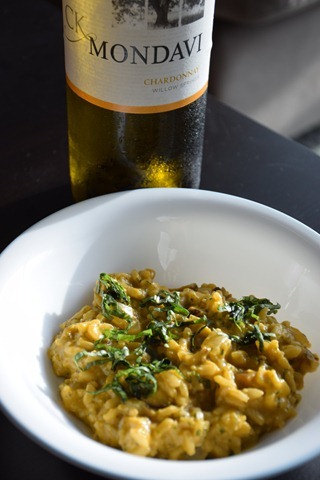 Even though I don’t drink, I have on occasion cooked with wine and the depth of flavor is truly wonderful – never had a risotto like this though! yum! You should try it! And you don’t need the wine necessarily. The pesto, however, is a must!